Before we get to the second round of our tournament, I'd like to share a tip we received from a reader named Jeffrey. Jeffrey is not himself a Name of the Year nominee, but he is a Brandeis alum familiar with Mingus Mapps, the Bulltron Regional's 8-seed and a Brandeis poli-sci professor. We are, Jeffrey explained, "selling Mingus Mapps short" by not including his middle name, Ulysses. "Get his middle name involved!" Fear not, fair Judge; we are well aware of Mingus' middle name. And yes, Mingus Ulysses Mapps is an epic odyssey of a handle. Nonetheless, most of the onomasts involved in the creation of this bracket agree that middle names often have negative effects on cadence. In this case, we like Mingus Mapps' name more when his wonderful alliteration is intact. In most cases, name-inee middle names tend to grab attention at the expense of flow, meter, and rhythm. Middle names cause inflation, and we're trying to keep our currency stable. Otherwise, Pablo Diego José Francisco de Paula Juan Nepomuceno María de los Remedios Crispiniano de la Santísima Trinidad Ruiz y Picasso and Dikembe Mutombo Mpolondo Mukamba Jean-Jacques Wamutombo would battle it out for the championship every single year. Occasionally, there's room on the ballot for a Queena Flomp Traggis or a Ratan Naval Tata, but this year, we included only one middle name: Norman Bevis Many Fingers, whose middle name matches the trochaic foot of its brothers. Our apologies to the stellar but ultimately unnecessary middle names of Radiance (Monet) Ham, Ignatius (Theodore) Babbage-Hockey, and, yes, Mingus (Ulysses) Mapps. Mingus Mapps certainly didn't need his third name in the first round, cruising past Harlene Freezer to set up a date with formidable 1-seed Curvaceous Bass. Bass is one of the four names included in a recent Name of the Year PSA created by a friend of the blog, who also highlighted fellow second-rounders Jetta Disco, Norman Bevis Many Fingers, and Dr. Loki Skylizard. All four of those names, along with 28 others, are in action today. Who will receive your vote? 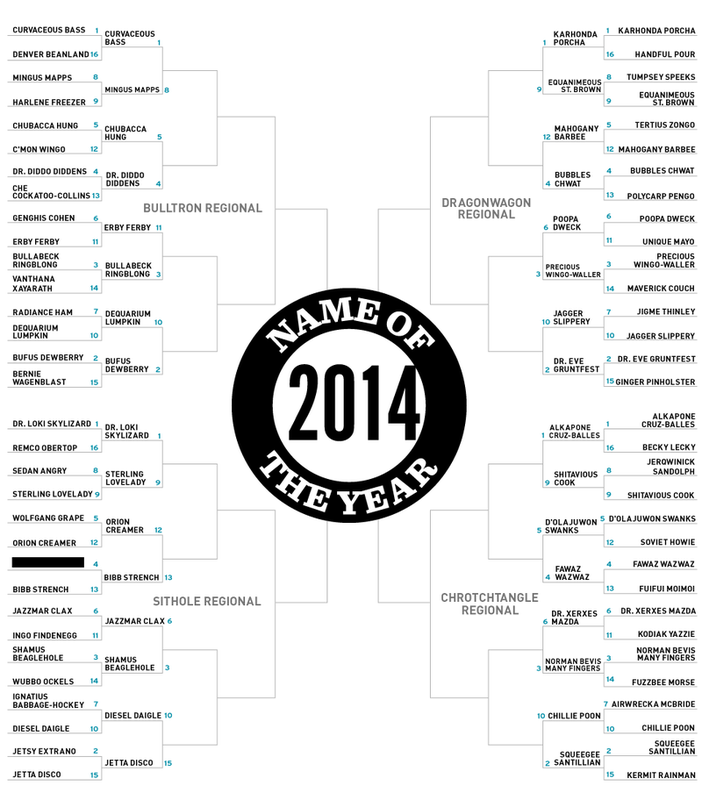 As a reminder, follow us @notytourney for updates and send any nominees to nameoftheyear@gmail.com. The Sweet 16 will kick off next week. Sam Gutelle is a Brooklyn-based blogger who predominantly covers the online video industry for Tubefilter. He has helped run the Name of the Year blog since 2013 despite his relatively boring name. You can follow him on Twitter @gutelle.